I grew up in Western Massachusetts as a very passionate, emotional creature and was encouraged to pursue the Visual Arts by my parents who enrolled me in Art and painting classes throughout my childhood. I attended Greenfield Community College and Hartford Art School as a Printmaking major, and my experiences, particularly at Greenfield, have had a profound effect on the shape and direction that my Art has taken. In the 20 years since, I have become a painter and I have learned that all of my experiences, loves, nightmares, quandaries and questions are the exquisite fuel for my work. Living fully and bringing that full life to my Art is the nature of my process. Over the years, one of the central themes in my work has been a profound recognition of my symbiotic relationship with the rest of the human and non-human planet. Through that work, I continue to strive for clarity about what these connections offer us: peace, empowerment, rationality, divinity and deep roots. I spend a great deal of time in the woods and mountains, hiking everyday and bringing what I find and feel back to my Art, and thus, the natural world has become my greatest muse and partner. Through my work, I can speak a language that expresses intuitive responses, some that I don�t understand or can�t explain in words, but that I can make a more certain kind of sense of by creating a picture. I make Art because it so fully and immediately fulfills that need to express and communicate much of our subtle inner landscapes. In recent years, my Art has begun to focus on the interweaving of social justice and our connections and disconnections to the natural world. I am using connections to nature and creatures as a support to lift up those involved in the struggles for social justice, as bugs, bats, vines, eggs, seeds, fish, owls and bones mix and intertwine in my work. They loop into lungs and out of mouths; they tie everything together: the workers, the ants, the activists, the despots, the tree roots. This is reality, tied together. 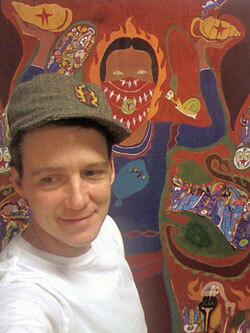 I have shown extensively in galleries across the U.S. in the past 20 years but I have recently made a shift away from Art Galleries and toward making and showing art for Communities and Community spaces because I have come to believe in the importance of Art that is made to be shared in the places we live, on the streets and in our everyday lives. I am currently a member of the Cottage Street Studio Artists in Easthampton Massachusetts and I am working full time on bringing all of the above elements into my current project: Roots To Resistance.